This door design and finish combination creates a fresh and airy feel to the kitchen. With contrasting solid wood worktops it really does have that summer sense about it. With its vanilla doors and fresh decor, this appealing kitchen conjures up a feeling of sunshine and hot lazy days! Solid wood worktops, barley twist pilasters and stylish over mantle add just the right amount of detail without it being too ornate or formal. Prior to October 2012 our Premier Calcutta design was know as the York. 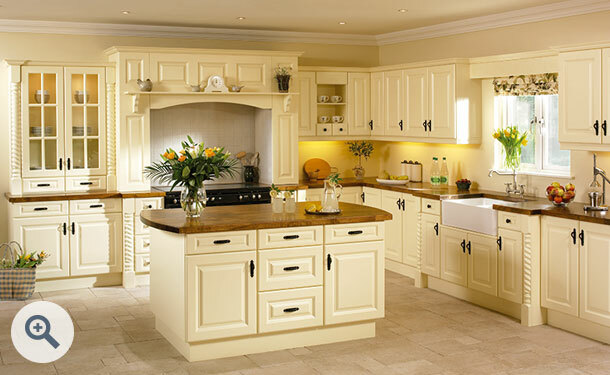 Premier Calcutta design drawer fronts in Vanilla start at just £6.41 and doors start at £15.29. Click the button to request a free large sample swatch of Vanilla. Click the button to purchase a Sample Premier Calcutta design door in the Vanilla finish. 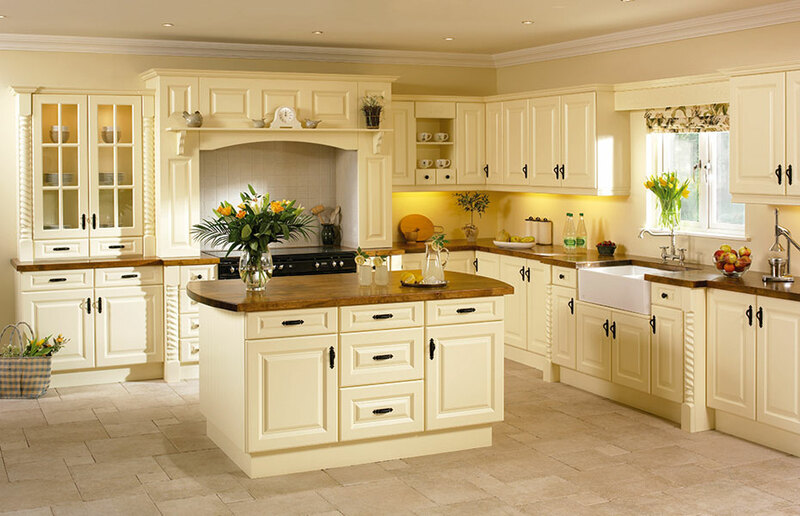 The Premier Calcutta design is also available in ALL non-gloss finishes. The Premier Calcutta design is also available in ALL high gloss finishes. Please Note: The Premier Calcutta design is not available in any high gloss finishes.